Titanium SuperRoad - Dominate the Road: This Titanium Disc brake road bike can do it all and on that magic carpet titanium ride you'll love. Newest Shimano R8000 Ultegra 2x11 deraileurs, World Class Powerful Shimano R8000 Hydraulic Disc Brakes, WTB TCS Tubeless compatible rim wheelset, Lightweight Butted Multi-Shaped Titanium. Precision Carbon bladed forks are performance matched to frames and Now with Through-Axles front and rear for the highest precision ride quality. Well equipped with 700x28c Continental Tires. Capable of using tires as wide as 700x40c to dominate gravel roads or as narrow as 700x25c for maximum speed on your commute. Laugh and float over rough roads, chipseal. Rumble over gravel and revel in your powerful hydraulic disc brakes through virtually all weather conditions. 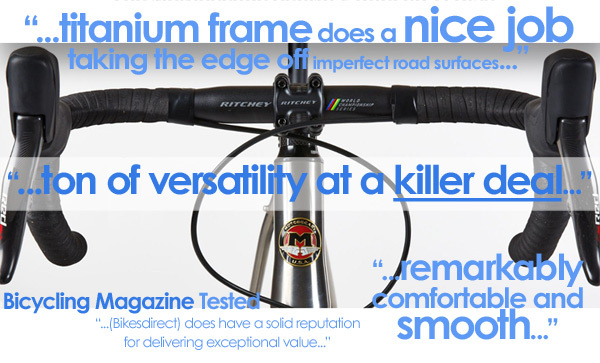 Perfect for the mid to PRO level athlete wanting the toughness and performance of an Titanium frame, coupled with the comfort of a carbon fork and the power of hydraulic brakes. 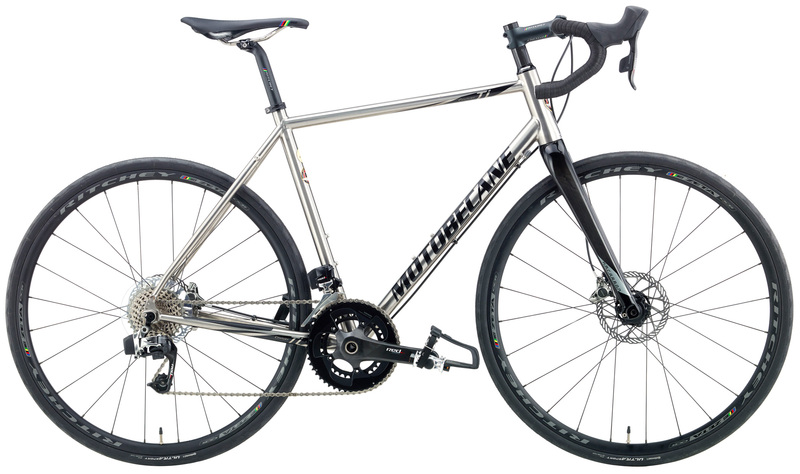 This model has Compact Double cranks for even more hill-crushing performance that is lighter than a triple crank. Features new high performance Butted and Multi-shaped Titanium frames. SuperRoad / Gravel design means wide tires fit for comfortable and versatile riding. WTB TCS Tubeless Compatible WHEELSET amazing ride quality - worth $500+ alone! 50cm - Fits Most 5'5" to 5'7"
53cm - Fits Most 5'7" to 5'9"
55cm - Fits Most 5'9" to 5'11"
58cm - Fits Most 5'11" to 6'1"
61cm - Fits Most 6'1" to 6'3"
Frame SuperRoad Disc Brake 700C Butted / Multi-shaped Advanced Heat Treated 3/2.5 Titanium, 2xH2O mounts, Wide Tires Fit, 68mm threaded BB Shell, Headtube TITANIUM UPPER 1-1/8"/LOWER 1.5" TAPER (46x42/55x52.1mm) L: 50/53/55/58/61CM=125/145/160/180/200mm, DROPOUTS(DO) TITANIUM VERTICAL W/REPLACEABLE HANGER, W/POST DISC MOUNT . O.L.N:135MM (142MM THRU-AXLE Equipped) Rear rack brazeons.